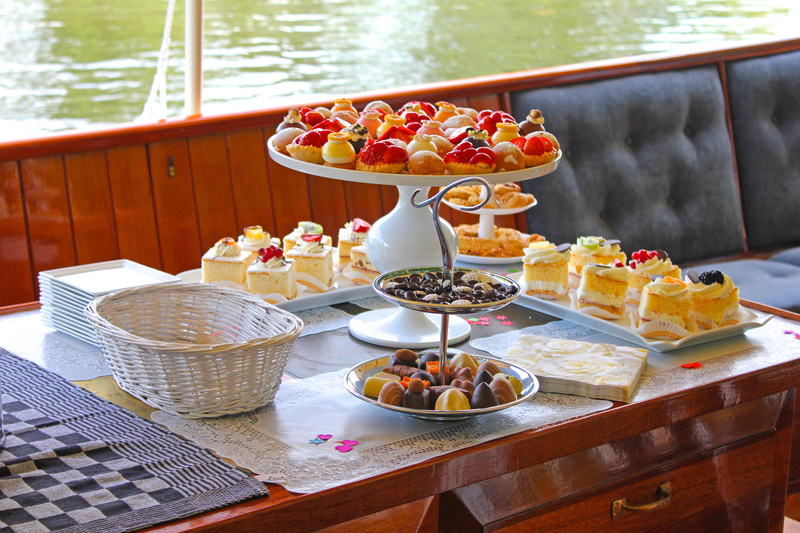 A boat trip along the historical outdoor areas and beautiful pavilion tea houses from yesteryear that stand gracefully along the Vecht is unforgettable. During the trip you’ll enjoy our High Tea arrangement. Would you like to relax and enjoy yourself and find out why these beautiful tea houses have been built? Book your round trip now! The High Tea round trip is perfect if you have something to celebrate, like a wedding, or just with family, colleagues or clients. We take you along beautiful outdoor areas along with a couple of real castles. The nature is an absolute feast for the eyes! This arrangement requires a minimum of 10 people. If your group consists of less than 10 people we will charge for 10. An extensive High Tea, served during the round trip, with coffee and tea. For each half hour extra €8,00 per 1/2 hour p.p. Boarding location: Departure from the quay in Nieuwersluis. Other boarding locations are possible on request. Including: VAT, skipper and bridge lock fees. Payment: Payment can be done in cash or card after the trip, companies can receive an invoice afterwards. Conditions: Our general terms and conditions apply to this trip. Group size: Groups with a minimum of 10 adults and a maximum of 22 people. For bigger groups we will use multiple boats. Reservation: Booking the trip is required. For more information and / or placing a reservation?